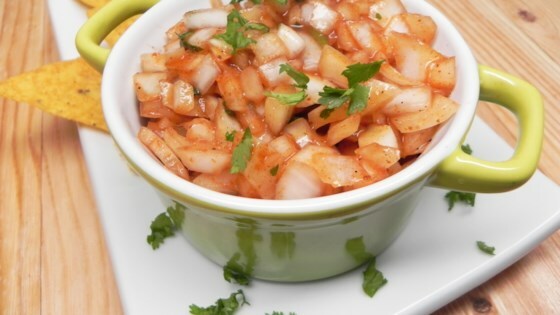 "Spicy onions just like the ones served in Indian restaurants as a side dish! Delicious served with crispy pappadums as a starter for any Indian meal!" In a medium bowl, stir onion and ketchup until onion is thinly and evenly coated. Mix in the lemon juice. Season with sugar, cilantro, fenugreek and chili powder, and mix thoroughly. Cover, and chill for 24 hours. This allows the lemon juice to neutralize the onion flavor slightly. Just put onions in vinegar (preferably malt vinegar), add a little salt and 2 split green chillies. Leave overnight. Its ready to eat when the onions start turning pink. Changed nothing, this is great. We found it hot enough as per recipe.great with a few cold beers, some spiced onion and poppadums!! !